If your eyelids look inflamed and your eyes feel itchy and watery, you may be one of the many Americans who suffer from a condition known as blepharitis. A number of underling conditions can contribute to this chronic annoyance. The good news is that you can manage your blepharitis with the expert help of our optometry team at Total Eyecare in Elko, NV. We can figure out what's causing your particular symptoms and then prescribe soothing treatments to help you get them under control. 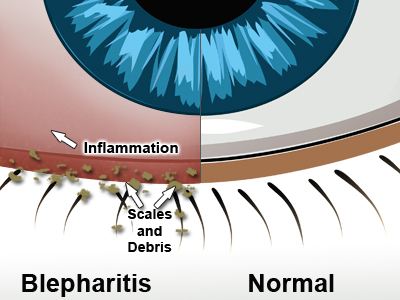 Blepharitis is the general medical term for eyelid inflammation, but we use it to describe some specific circumstances and symptoms. Classic blepharitis tends to occur around the eyelashes, which are nourished by their own oil glands. Blockages in the oil glands cause the eyelids to become reddened, swollen, and irritated. Fungi, bacteria, dry eye syndrome, and Demodex mites can also trigger blepharitis. The condition may also be caused by a failure of the eyelid's Meibomian glands to produce oil. Blepharitis doesn't just make your eyelids unsightly and uncomfortable. It can also affect your eyes, creating redness, itching, watering, and a gritty sensation in the eyes. (These symptoms are also the classic symptoms of dry eye, and the two problems frequently occur together.) While blepharitis does not pose a direct danger to your eyelids, it may make you vulnerable to other conditions such as pink eye, styes, or chalazions on the eyelids, misdirected eyelashes, and the corneal damage associated with dry eye. Blepharitis is a chronic condition, meaning that your best bet is to manage the condition rather than hope for a total cure. Fortunately, our Elko optometry team can help you do just that. We can confirm a case of blepharitis through an eye exam and then prescribe a combination of home remedies and in-office care. Warm compresses can often relieve discomfort, while eyelid scrubs can remove irritating mites and bacteria from the eyelids. We can perform clinical procedures to restore Meibomian gland function or give your eyelids a thorough, professional cleaning. You may also benefit from medicated ointments to soothe the eyelid skin and/or eye drops to ease eye irritation and other eye symptoms. Contact lenses can impede the progress of blepharitis treatment. Our optometry team may recommend that you put your contacts aside until you've completed a round of blepharitis care. Blepharitis can be a real bother, but you don't have to let it dominate your life. Call Total Eyecare today at (775) 738-8491 to schedule care at our Elko clinic!